My husband continues to upstage me on the frugality stakes, bearing bargains back to the house on an almost daily basis.This week's triumph was 750g of mushrooms, reduced to 79p in the Co-op. Needless to say it's yours truly who has to make good use of them and ensure they don't go to waste. And the rest of the mushrooms? I added them to the tail end of a coq au vin, adding a good Floyd-like slosh of extra red wine and served the resulting sauce with pappardelle (thick pasta ribbons). Which was also a success. Maybe I should let my husband do the shopping after all . . . Were you - are you - an admirer of the late, lamented Keith Floyd? And have you ever tried one of his recipes? Must try this recipe. I watched Floyd's early programmes, he was so entertaining! Never tried his recipes. I definitely am an admirer of him, he was an amazing man. His method of cooking will definitely live on with me, some wine in the pot and a glass for the chef too! I have a couple of his books and have cooked a few from each. I loved his style of cooking - full of enthusiasm and fun. I really enjoyed Keith Floyd's tv programmes, and his books. He was an outdoors version of the galloping Gourmet, does anyone remember him? Or am I showing my age! I don't have any of his books on the boat but have a complete collection in an attic in the UK! I love the books too. Even though the recipes are sometimes rather wild and slapdash they're always based on a sound combination of ingredients. I also have Floyd on France which has some great-sounding recipes - along with some fairly nutty ones. Thanks for the recipe, Fiona - one for me to try as I love mushrooms. I remember first watching Floyd on tv and loving his style and bossing the camera around. Never bought any of his books though. I used to love Floyd when he was first on TV, the anarchic style and the enthusiasm, but sadly over the years he just became a parody of himself, it was painful to watch. I have only ever owned Floyd on France and Floyd in the Soup and I can't say I've ever conciously followed one of his recipes, but I know that at some point I've cooked something based on something I've seen him do. 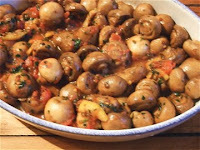 I must make mushrooms a la grecque again soon, they are very nice to have in the fridge to pick at. I can't remember where I originally got my inspiration for them from - possibly Elizabeth David ? but I do mine without the tomatoes and with white wine ( good for using up the odd half a glassful ) and coriander seeds and fresh coriander/parsley. Yum ! What a delicious bargin! Funny, I really enjoyed Keith Floyd and have several of his books, but i don't remember cooking any of the recipes..you have tempted me to rectify this. Thank you Fiona! I never read Floyd in the Soup - will have to look out for that. Agree he became quite sad, in the later years Greenlady, but I did enjoy those earlier programmes. I never used to make mushrooms a la grecque with tomatoes either but with oil and white wine. It did have the crushed coriander though which is crucial. I think I'll definitely be trying another Floyd recipe soon. They're quite simple and unusual. I made this for tea tonight and it was far too acidic with the vinegar,lemons and tomatoes...was so excited try it but we couldn't eat it. Not so frugal. Still it is always good to try something new. 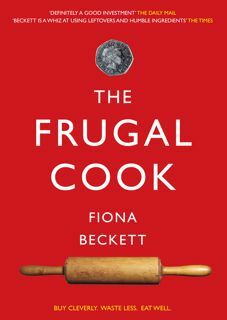 So farewell Frugal Cook . . . The cost of a recipe is relative . . .